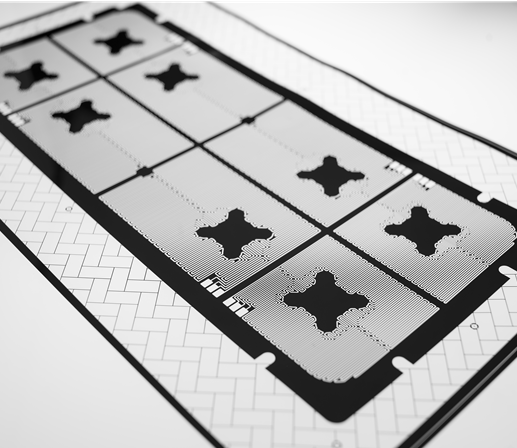 Birk Manufacturing designs thousands of wire and etched-foil circuits each year to meet the specific needs of our customers. We can offer our customers the many features highlighted below. Many times, heaters need to fit around holes and cutouts. Either etched foil or wire circuits can be used to provide heating of only the desired surface area. Often, we need to maximize surface area to spread the watt density. Multi-layer circuits can be used to fit a high resistance in a small area by putting two circuits in a series. A multi-layer circuit also allows us to put a sensor flex circuit on top of the heater circuit to maximize the heated area. To control heat and temperature limits properly, thermostats, RTDs, thermocouples, thermistors, solid state sensors and fuses are strategically placed within a circuit to achieve the best operating thermal system. Birk can offer many different terminations, such as soldered connections, welded connections, connectors, pins and zero-insertion-force connections. Different heat intensities in the same circuit can provide even heat across an entire area, and can compensate for cool heat-sink edges. A single heater can be designed to operate on more than one voltage through the inclusion of dual circuits with three leads. Since the heater circuit is a resistor, taps can be taken anywhere along that circuit to provide a given voltage to an LED or other component that requires other than line voltage. Sensors are generally located within a heated area. Non-heated flex circuits can be built into the circuit design to carry sensor signals to instruments.